The solar sector is reeling from confusion, and stock prices are reeling right along with it. The time it has taken investors and traders to wrap their heads around Trump’s industry tariffs and the pyrrhic victory of two solar companies in a case against cheap Chinese imports has seen stocks rally in a big way, and then fall just as hard. The rally did not last long, though. While investors’ immediate reaction to the court ruling was of the unsurprising knee-jerk variety, reality started to set in over the last few days and solar stocks took a nosedive as sharp as the rally they enjoyed last week. Just what the solar companies needed after the ruling that threatened their chances of survival. On the face of it, the court case doesn’t seem like such a big deal, but nothing could be further from the truth. Narrowly speaking, bankrupt Suniva filed a complaint with the ITC claiming that cheap Chinese solar panels and cells were instrumental in the company’s declining performance. Suniva, whose owners are Chinese, was quickly joined by German-based SolarWorld in its claim. The key word in the case was “flooded”: the U.S. market, the plaintiffs claimed, was flooded with Chinese-made cells and panels. The solution? A floor price of US$0.78/W for modules and a US$0.40/W tariff for solar cells—enter the broader picture. Yet it’s easy to see why the ruling resonated with traders. Tariffs and floor prices are, after all, protective measures aimed—on the face of it—at protecting U.S. solar businesses from cheap imports. The problem is that sometimes, as in the Suniva/SolarWorld case, this is a dangerous oversimplification. Contrary to what the plaintiffs in the case were claiming, there was no “flooding” of any sort, according to the solar industry association in response to the court ruling. What Chinese exporters did was merely provide U.S. solar installations builders with the necessary materials­—namely, cells and modules. In fact, the SEIA said, the plaintiffs were trying to blame Chinese cell and module makers for their own failure to turn in a profit because their products were subpar, while the Chinese suppliers were simply filling a critical gap amid booming demand for utility-scale solar installations. The shares of utility-scale solar companies saw obvious effects of the investigation and the consequent ruling—chief among these: First Solar’s stock. The country’s largest solar panel manufacturer’s shares added a stunning 78 percent between the end of March and last week, hitting US$51.99 on September 22, the day of the ruling. On Monday, First Solar’s stock reversed to US$46.88 as investors started to wrap their heads around the actual implications of the ITC ruling. As of late-morning trading on Tuesday, FSLR was at $46.44, down 0.94 percent on the day and down over 5 percent on the week. This is where it gets complicated for First Solar, because it’s not black and white—and when it comes to stock prices, well, it depends who is paying attention and what they’re paying attention to, exactly. On the contrary, a tariff on Chinese solar module and cell imports would benefit First Solar by allowing it to continue to produce its own modules and cells in Malaysia while competitors grapple with higher import prices. Why? Because First Solar does not use crystalline silicon for its modules. It uses cadmium telluride for its thin-film PV panels, so the tariffs, which specifically concern the more popular crystalline silicone solar products, won’t affect it. But let’s not get ahead of ourselves. First Solar’s Series 4 is what is being produced in Malaysia, and that production capacity is being idled. So this immediate benefit of the tariff isn’t as great at it looks on the surface. It’s preparing for the launch of the Series 6 now, and it may have to reopen one idled factory in Vietnam to respond effectively to a hoarding urge in response to the ruling. This would add to the company’s cost burden in the short-term, but over the medium and long term, it could be a benefit—if tariffs go through. 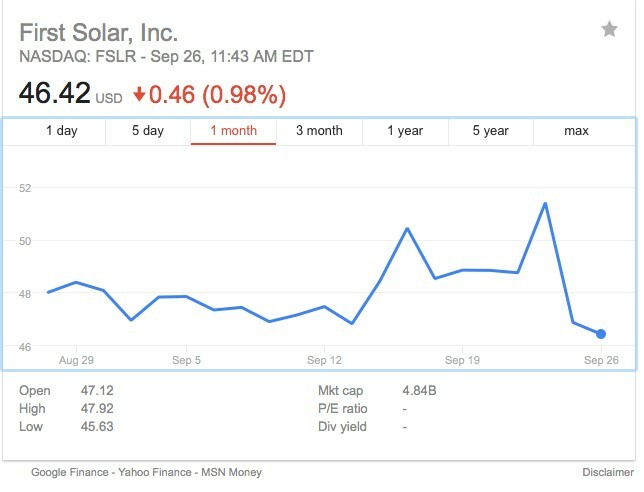 Right now, the drop in FSLR’s stock price reflects the general confusion as to what this means for all solar stocks, and the reality hasn’t yet set in regarding this company’s future in a new regulatory environment. It also reflects the fact that no one can be sure if these tariffs are going to see the light of day, given the level of opposition from the industry they are meant to protect. In the medium and long-term, First Solar could turn out to be one of the very few winners from the Suniva/SolarWorld case, so even though it’s lost over 5 percent this week, there’s room for a reversal.